As an animal lover, I’m appalled by a dark secret that is being kept for lucrative reasons. Unwanted horses are being imported, by the thousands, in a cruel fashion, loaded in cramped crates then flown across the ocean to Japan. Week by week, the horses are loaded from Edmonton and Calgary airports in Alberta and the Winnipeg airport in Manitoba. Japan imported 6.5 million pounds of horsemeat in 2016. The horses are being used for one specific purpose, a sushi dish called basashi. “The meat needs to be consumed within three days after being slaughtered in order to be eaten as sushi,” Ewa Demianowicz, campaign manager for Humane Society International, told The Dodo. 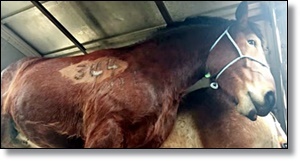 Horses are also used for their oil that is put in beauty products and sold all over Japan and South Korea.